It all comes down to this! 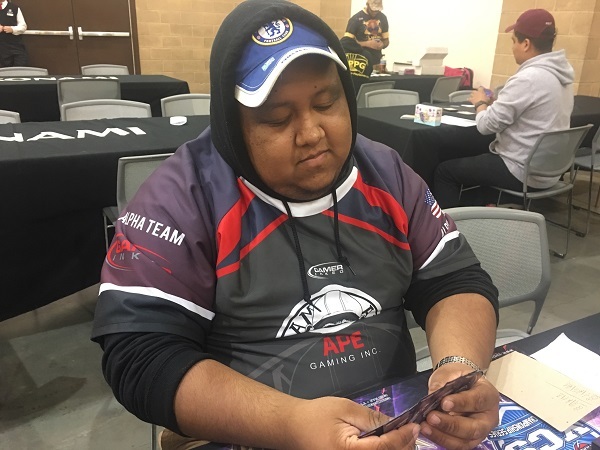 1411 Duelists entered YCS Pasadena and only 2 remain! 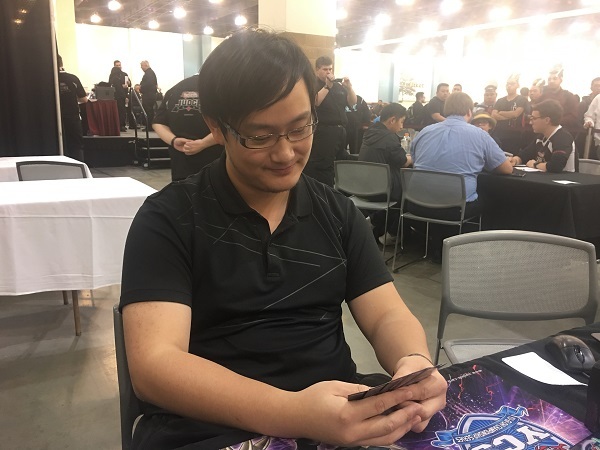 Shunping Xu from Philadelphia, Pennsylvania is about to Duel against Aldo Garcia Ruiz from Waukegan, Illinois in a Match that will determine the champion of YCS Pasadena. It’s Sky Strikers versus Goukis in this high-stakes final Match! Let’s Duel! Xu won the die roll and chose to go first. He opened up with Sky Striker Airspace – Area Zero, Shared Ride, Ghost Reaper & Winter Cherries, and 2 copies of Sky Striker Ace – Raye. He Normal Summoned Raye and then activated Area Zero. He used Area Zero’s effect targeting Raye, and then Chained Raye’s effect to Tribute it and Summon Sky Striker Ace – Hayate. He revealed the top 3 cards of his Deck to complete Area Zero’s effect and added Sky Striker Mecha – Eagle Booster to his hand. Then, he used Hayate to Link Summon Sky Striker Ace – Shizuku and Set Eagle Booster and Shared Ride face-down. In his End Phase, he used Shizuku’s effect to add Sky Striker Mobilize – Engage! to his hand. Garcia Special Summoned Junk Forward and then Set The Phantom Knights of Shade Brigandine. He flipped it to Special Summon it, and Xu activated the effect of Ghost Reaper & Winter Cherries in his hand. He revealed Isolde, Two Tales of the Noble Knights from his Extra Deck to banish 2 copies of Isolde from Garcia’s Extra Deck. Next, Garcia Normal Summoned Gouki Octostretch. He sent Octostretch, Shade Brigandine, and Junk Forward to the Graveyard to Link Summon Summon Sorceress and then activated the effects of the Sorceress and Octostretch. Xu Chained Shared Ride, and Garcia Special Summoned Malicious to Xu’s field with Sorceress and added Gouki Headbatt to his hand. Xu drew a card off of the effect of Shared Ride. Garcia used his Sorceress’s effect to Special Summon a Twistcobra from his Deck and then activated Instant Fusion. He paid 1000 Life Points to Special Summon Invoked Raidjin from his Extra Deck and then sent Raidjin and Twistcobra from his field to his Graveyard to Link Summon Knightmare Cerberus. He discarded Shade Brigandine from his hand to use Cerberus’s effect and destroy Malicious, and added Gouki Re-Match to his hand with Twistcobra’s effect, allowing Xu to draw another card with Shared Ride. Garcia activated the Re-Match next, Special Summoning Twistcobra and Octostretch from his Graveyard in Defense Position. He combined Sorceress with Twistcobra to Link Summon Firewall Dragon co-Linked to Cerberus and then banished Malicious from his Graveyard to Special Summon another Malicious from his Deck. He then sent Malicious and Octostretch to the Graveyard to Link Summon Binary Sorceress co-Linked to Firewall and used his Firewall’s effect to Special Summon Headbatt from his hand. He then used Firewall’s effect to return Octostretch from his own Graveyard to his hand and return the Raye in Xu’s Graveyard to Xu’s hand. Xu drew another card off of Shared Ride, leaving him with 3 copies of Raye, a Sky Striker Mecha – Hornet Drones, Sky Striker Mobilize – Engage!, and Sky Striker Mecha Modules – Multirole in his hand. Garcia combined his Cerberus with Headbatt to Link Summon Tri-Gate Wizard next, and activated the effects of Firewall and Headbatt. He added a Gouki Riscorpio to his hand with Headbatt’s effect and Special Summoned it to the field with Firewall’s effect. Xu drew another card off of Shared Ride. Next, Garcia used his Binary Sorceress’s effect to halve the ATK of his Binary Sorceress and give its ATK to Firewall Dragon, bringing Firewall’s ATK up to 3150 ATK. 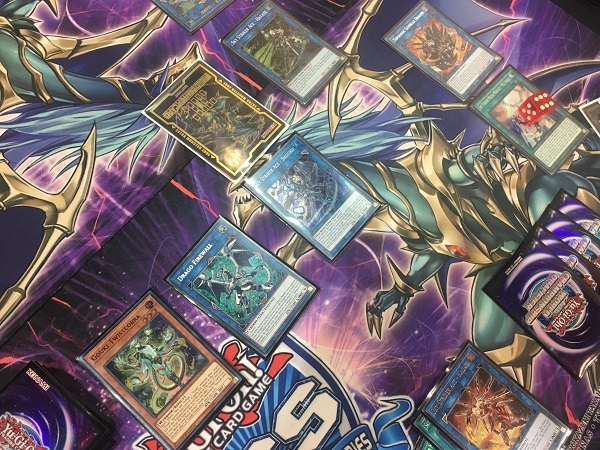 Garcia banished a Malicious from his Graveyard to Special Summon one from his Deck next, and then sent Riscorpio and the Sorceress to the Graveyard to Link Summon Knightmare Unicorn co-Linked to Firewall and Tri-Gate. He used the effects of Firewall and Unicorn, discarding Octostretch to use the Unicorn’s effect. He shuffled Area Zero back into the Deck and drew a card, and added Suprex to his hand with the effect of Octostretch. He Special Summoned the Suprex to his field, and Xu drew Twin Twisters with the effect of his Shared Ride. Garcia sent Malicious and Suprex to the Graveyard to Link Summon Knightmare Phoenix next, and discarded Instant Fusion to target Xu’s face-down Eagle Booster, which Xu Chained to protect Shizuku from card effects for the turn. Garcia used Suprex’s effect to add Twistcobra to his hand, and Xu drew a Sky Striker Mecha – Widow Anchor from his Deck with Shared Ride. He then used Knightmare Phoenix to Link Summon Knightmare Mermaid and activated the Mermaid’s effect by discarding a Divine Sword – Phoenix Blade. He Special Summoned Knightmare Corruptor Iblee from his Deck and drew a card. Then he Link Summoned Topologic Gumblar Dragon. Garcia attacked Shizuku with Mermaid, destroying his own Mermaid in battle, and Garcia Special Summoned Twistcobra from his hand with Firewall’s effect. Since it was Linked to Firewall, Garcia was forced to use the effect of Gumblar. He discarded the last card from his hand – Reinforcement of the Army – and Xu discarded Sky Striker Ace – Raye. Tri-Gate attacked and destroyed Shizuku, and Xu Special Summoned Raye from his Graveyard with its effect. Firewall attacked Raye, and Xu Chained Raye’s effect to Tribute it and Special Summon Sky Striker Ace – Kagari from his Extra Deck. He used Kagari’s effect to return Sky Striker Mecha – Eagle Booster to his hand and then Firewall attacked and destroyed Kagari. Direct attacks from Gumblar and Twistcobra dropped Xu’s Life Points down to 1250. Xu drew a card and then had 10 cards in his hand thanks to Shared Ride! He activated Sky Striker Mecha Modules – Multirole and then Set Reinforcement of the Army. He used Twin Twisters to discard Ghost Reaper & Winter Cherries and destroy his own face-down Reinforcement of the Army, getting 3 Spells into the Graveyard. Next, he used Sky Striker Mobilize – Engage! to add Widow Anchor from his Deck to his hand and draw Ghost Belle & Haunted Mansion. He Summoned Raye and used it as a Link Material to Summon Kagari. He used Kagari’s effect to return Engage to his hand and used Engage to get his third Widow Anchor from his Deck! He drew Sky Striker Mecha – Eagle Booster to complete Engage’s effect and then activated Hornet Drones. 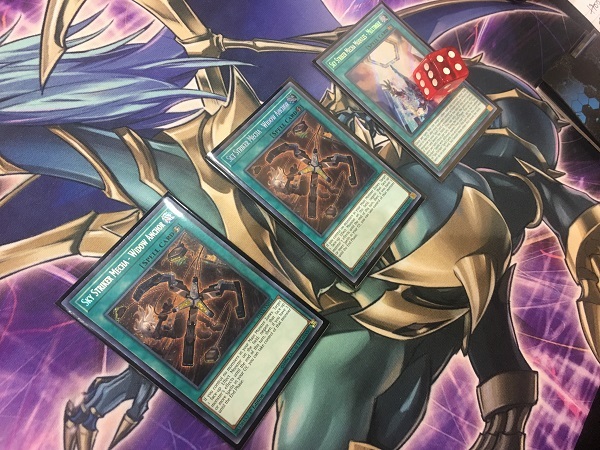 He Chained all 3 copies of Widow Anchor in Chain Links 2, 3, and 4 to take control of Gumblar, Firewall, and Twistcobra. Then, he used Kagari as a Link Material to Summon Hayate and used the Token as a Link Material to Summon Shizuku! Attacks from all of Xu’s monsters, including the ones he gained control of with Widow Anchor, wiped out all 6300 of Garcia’s remaining Life Points! Despite an incredible opening turn by Garcia, Xu manages to take the win with 3 copies of Widow Anchor! Garcia started off Duel 2 by activating Reinforcement of the Army to add Gouki Suprex to his hand. He then Set Shade Brigandine and flipped it to Special Summon it, prompting Xu to discard Ghost Reaper & Winter Cherries. He revealed Isolde from his Extra Deck and banished 2 copies of it from Garcia’s Extra Deck. 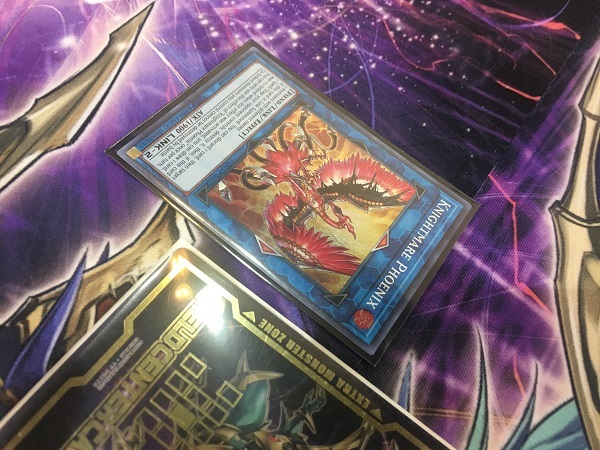 Garcia then sent his 2 monsters to the Graveyard to Link Summon Knightmare Phoenix and used Suprex’s effect to add Gouki Octostretch from his Deck to his hand. He ended his turn with just a Knightmare Phoenix on the field! Xu started off his turn with Reinforcement of the Army, Sky Striker Mecha – Hornet Drones, PSY-Frame Driver, and Ghost Ogre & Snow Rabbit in his hand. He drew Sky Striker Maneuver – Afterburners! for his turn. He activated Reinforcement of the Army to add Sky Striker Ace – Raye to his hand and Garcia sent Droll & Lock Bird from his hand to his Graveyard to activate its effect. Xu activated Afterburners to destroy Knightmare Phoenix and then Summoned Raye. He attacked directly with Raye to deal 1500 points of damage and then used Raye’s effect to Tribute it and Special Summon Sky Striker Ace – Hayate. He attacked directly with Hayate and used Hayate’s effect to send Sky Striker Mecha – Shark Cannon from his Deck to his Graveyard. In Main Phase 2, he sent Hayate to the Graveyard to Link Summon Kagari and used Kagari’s effect to return Shark Cannon to his hand. He Set Shark Cannon and Hornet Drones before ending his turn. Garcia Normal Summoned Knightmare Corruptor Iblee and activated its effect to try to Special Summon Knightmare Phoenix; but Xu discarded Ghost Ogre from his hand to destroy Iblee and stop its effect from resolving! Garcia then ended his turn with a clear field! Xu drew Ghost Reaper & Winter Cherries and then sent Kagari to the Graveyard to Link Summon Hayate. He attacked directly with Hayate to drop Garcia down to 3500 Life Points and then used Hayate’s effect to send Sky Striker Mecha – Widow Anchor from his Deck to his Graveyard. Next, he Link Summoned Kagari and used its effect to return Widow Anchor to his hand. He then Link Summoned Shizuku, Set Widow Anchor, and entered his End Phase. He added Sky Striker Mobilize – Engage! to his hand in the End Phase with Shizuku’s effect. Garcia drew to 4 cards in his hand and then Normal Summoned Octostretch. He sent it to the Graveyard to Link Summon Linkuriboh and used Octostretch’s effect to add Gouki Re-Match from his Deck to his hand. Xu flipped Shark Cannon to banish Suprex from Garcia’s Graveyard. Next, Garcia activated D.D.R. – Different Dimension Reincarnation and discarded Malicious to Special Summon Suprex back to the field. Garcia combined his 2 monsters to Link Summon Knightmare Phoenix and then discarded a Droll & Lock Bird to activate the Phoenix’s effect and destroy Xu’s face-down Hornet Drones. Garcia used his Suprex’s effect to add Gouki Twistcobra from his Deck to his hand. Next, Garcia banished Destiny HERO – Malicious from his Graveyard to Special Summon another copy from his Deck and combined Malicious with Phoenix to Link Summon Knightmare Unicorn. He activated the Unicorn’s effect by discarding Twistcobra and tried to return Shizuku to the Deck; but Xu Chained Widow Anchor to negate the effect of Unicorn and take control of it. Garcia activated Gouki Re-Match to Special Summon Twistcobra and Octostretch from his Graveyard next, and then banished a Malicious from his Graveyard to Special Summon another one from his Deck. On its Summon, Xu discarded Ghost Reaper & Winter Cherries and revealed Firewall Dragon from his Extra Deck to banish Firewall from Garcia’s Extra Deck. In the End Phase, Garcia regained control of his Knightmare Unicorn. Xu drew a second copy of Sky Striker Mobilize – Engage! for his turn! He activated one copy to add a Sky Striker Mecha Modules – Multirole to his hand and draw a Terraforming. He used the Terraforming to add Area Zero this hand and then activated Multirole. He used Engage next, adding a Widow Anchor to his hand and drawing PSY-Framegear Gamma from his Deck. He used Shizuku as a Link Material to Summon Kagari and then used Kagari’s effect to return Engage to his hand. He activated Area Zero and then used Area Zero to destroy Kagari and add another Engage to his hand. He activated an Engage to add a Widow Anchor to his hand and draw another Gamma from his Deck and then used his last Engage to add Multirole to his hand and draw Enemy Controller! He used Multirole to send Area Zero to the Graveyard and activated its effect. He Chained two copies of Widow Anchor to take control of Unicorn and Twistcobra, prompting Garcia to concede. Shunping Xu is the champion of YCS Pasadena with his Sky Striker Deck! Sunday’s ATTACK OF THE GIANT CARDS!! Winners YCS Pasadena: The Finals Are About to Begin!